I’ve complained many times about the pointless nature of anti-money laundering laws. They impose very high costs and force banks to spy on their customers, but they are utterly ineffective as a weapon against criminal activity. Yet politicians and bureaucrats keep making a bad system worse, and the latest development is a silly scheme to ban $100 bills! It also seems that poor people are the main victims of these expensive and intrusive laws. According to a new World Bank study, half of all adults do not have a bank account, with 18 percent of those people (click on nearby chart for more info) citing documentation requirements – generally imposed as part of anti-money laundering rules – as a reason for being unable to participate in the financial system. But this understates the impact on the poor. Of those without bank accounts, 25 percent said cost was a factor, as seen in the chart below. But one of the reasons that costs are high is that banks incur regulatory expenses for every customer, in large part because of anti-money laundering requirements, and then pass those on to consumers. Here are some of the key points in the World Bank report. 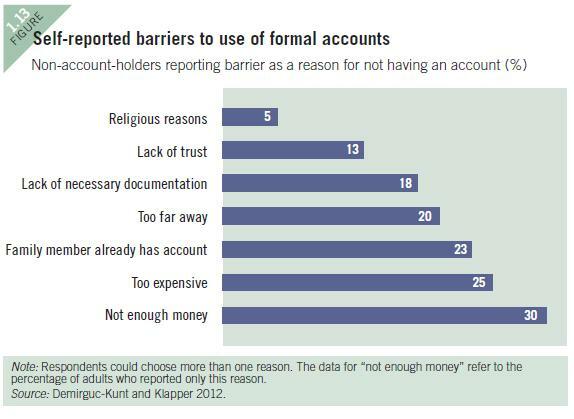 The data show that 50 percent of adults worldwide have an account at a formal financial institution… Although half of adults around the world remain unbanked, at least 35 percent of them report barriers to account use that might be addressed by public policy. …The Global Findex survey, by asking more than 70,000 adults without a formal account why they do not have one, provides insights into where policy makers might begin to make inroads in improving financial inclusion. …Documentation requirements for opening an account may exclude workers in the rural or informal sector, who are less likely to have wage slips or formal proof of domicile. 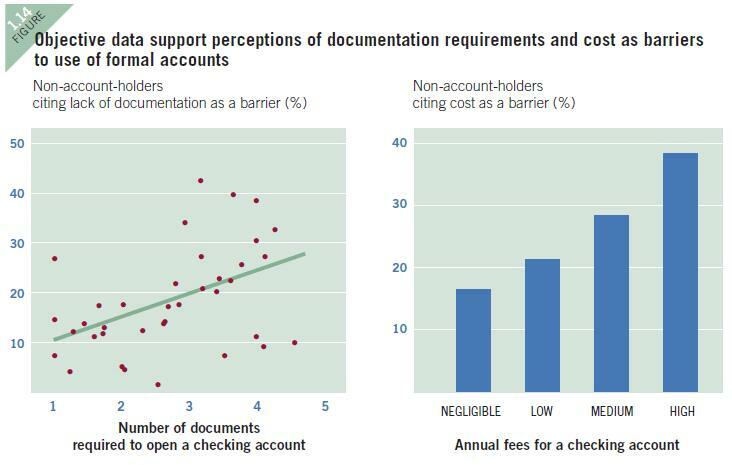 …Analysis shows a significant relationship between subjective and objective measures of documentation requirements as a barrier to account use, even after accounting for GDP per capita (figure 1.14). Indeed, the Financial Action Task Force, recognizing that overly cautious Anti-Money Laundering and Terrorist Financing (AML/CFT) safeguards can have the unintended consequence of excluding legitimate businesses and consumers from the financial system, has emphasized the need to ensure that such safeguards also support financial inclusion. One would hope honest leftists, who claim to care about the poor, would join with libertarians to roll back absurd anti-money laundering requirements. Heck, one would hope honest conservatives, who claim to be against pointless red tape, would join the fight as well. Here’s the video I narrated on the general topic of money laundering laws. I think it makes very good points, but I wish this data had been available when I did the video so I could explain how low-income people are the main victims.